Beside of USBDM, there is another Open Source implementation of a debug interface for the Freedom Board OpenSDA: CMSIS-DAP. CMSIS-DAP stands for ‘Cortex Microcontroller Software Interface Standard – Debug Access Port’) has been published by ARM Inc. With this, there is an open source alternative to proprietary implementation (e.g. P&E OpenSDA or Segger OpenSDA). 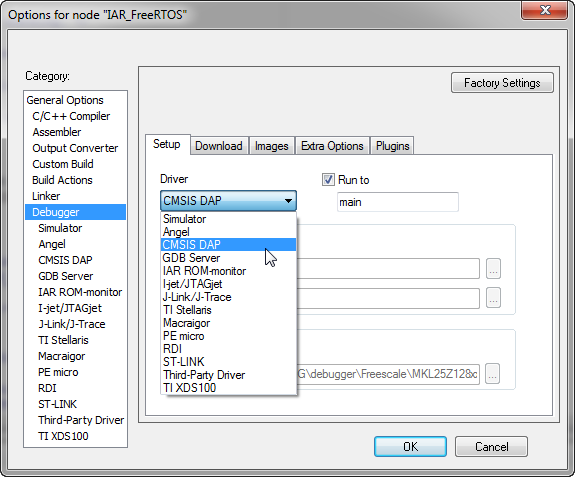 Beside of the ARM MDK IDE, CMSIS-DAP is supported by Coocox and IAR. And IAR is what I’m using in this post. The CMIS-DAP firmware sources are availble from ARM CMSIS-DAP: (requires registration). Unfortunately, this is set up to be compiled with the ARM/Keil MDK IDE :-(. Power the FRDM-KL25Z with reset button pressed: green LED flashes. Copy the CMSIS-DAP_OpenSDA.s19 to the BOOTLOADER device. Repower the board without the reset button pressed. ❗ CMSIS-DAP now does *not* support a virtual COM (USB CDC) port. Such a port is supported by the original P&E OpenSDA and as well by the USBDM OpenSDA. With the CMSIS-DAP I have another open source OpenSDA debug interface beside of USBDM. USBDM is supported by CodeWarrior, and CMSIS-DAP is supported by IAR/Keil/Coocox, so this makes it an attractive alternative for the ‘open source lovers’. The low-level bootloader of the OpenSDA is not Open Source, but with CMSIS-DAP the chances are good to have a fully open source run control hardware plus software for ARM cores. And that CMSIS-DAP would the de-facto standard to debug any ARM core. And mbed jumped on the CMSIS-DAP wagon already (see links below). This entry was posted in Boards, Debugging, Embedded, Kinetis, KL25Z Freedom Board, Tips & Tricks and tagged Debugging, KL25Z Freedom Board, open source projects, OpenSDA, technology, Tips&Tricks, tool chains, USBDM by Erich Styger. Bookmark the permalink. I hope this is integrated with a GDB server. Then we would have a nice low cost unlimited toolchain. I tried to use the P&E one but could not get the licensing to work. 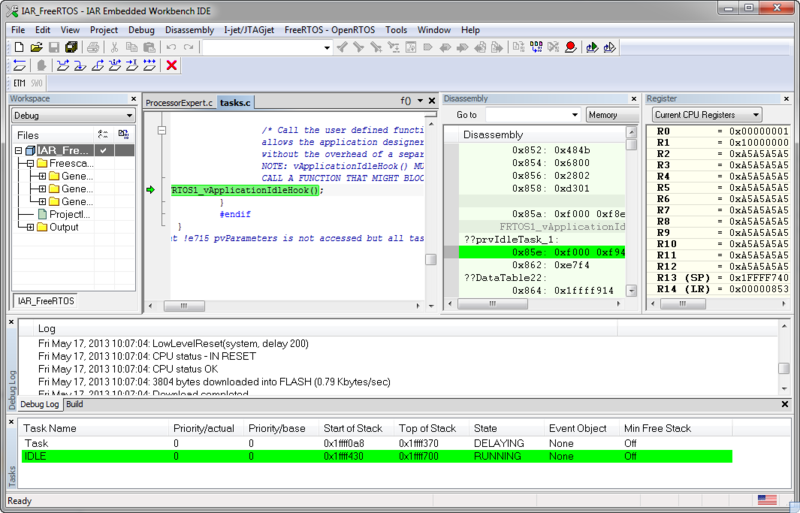 The GDB server for USBDM worked well with Eclipse + codesourcery. Only it could not “Run to Line” – it could be my error though. I like the idea of a FOSS unlimited toolchain for small companies who need to save capital for hardware/tools rather than pay for more compiler seats. As I have not looked into the P&E one: do you say the licensing terms did not work for you? Or is there any licensing enforcement which failed? I love FOSS tools, but at least to me it always a balance beween ‘do it yourself’ kind of thing or spending at least a few $ to get over that hump. I think with the great movement to ARM cores and the broad availability of vendors the prices already went down, or vendors are providing reasonable free limits. On the other side: some silicon vendors are affraid to give away their tools, because the ‘independent’ software tool vendors want to keep their business model. FOSS only works if there are people and users out there willing to spend their time and talent on this, with no or very limited return of investment. I guess the business model will change anyway. If CMSIS-DAP is avaliable for KL25Z itself with IAR, that is much better. 1.) Can this be used in Freescale CodeWarrior (specifically CW10.2) with Kinetis MCU (specifically K10 ==> Cortex M4)? 2.) 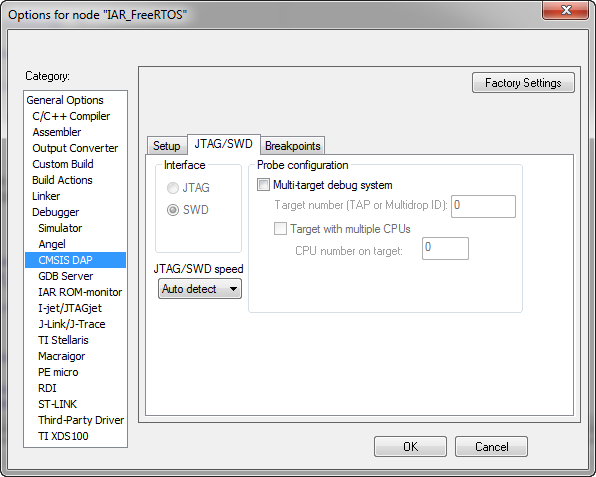 Does this option provide the same debugging tools as the P&E Tracelink? 2) For normal run control (setting breakpoints/etc) it is the same as P&E Tracelink. I have not measured the speed, but I feel that the P&E Tracelink is faster. But to my knowledge there is no trace support with CMSIS-DAP. Hi Erich – I know it’s an old post but the CMSIS-DAP block diagram graphic link seems to be broken. Thanks for pointing this out. The link is still working, but somehow the image does not show up. I have fixed it now. Thanks! Thanks for the links and the information provided! I have found the most difficult part for CMSIS-DAP is not to get a reasonable (or cheap) board. The problem is the quality of the flash programming/configuration files for boards and devices. It works ok for the more popular ones (e.g. FRDM-KL25Z), but as soon as another (less popular board or device) is used, in my experience it hardly works. The prpoblem is that i made these steps but i become this error: “Fatal error: CPU did not power up Session aborted!” and i don’t know why. can you check if the CPU is properly powered?